Bring the request off emoticon back! Love this app for my job, super easy! I’ve been waiting for this app my entire restaurant career. Everytime I try to pick up a shift. The app shuts down on me. And when I pick up the shift via internet website, the app gives me 8 notifications. “Various bug fixes and improvements.” The app requires constant updates. It’s excessive and disruptive. First time user here. Paid $3 for the app just to find out that the “create your account” button isnt even a button and doesnt work on the website OR the app. So i cant even start looking at my first schedule. NOT.COOL. The app loads for forever and can hardly boot up, requests I tried to put in wouldn’t go through giving me error message after error message, and I can’t see my replies to messages I’ve received from coworkers. Seriously amazing. It lets me know who I’m working with and how good my shift will be!! I am a general manager for kfc and we have hot schedules. But it won’t let me log into hot schedules through the app like I do at the store on the iPad. Overall the app can be decently helpful but there are a lot of shortcomings. 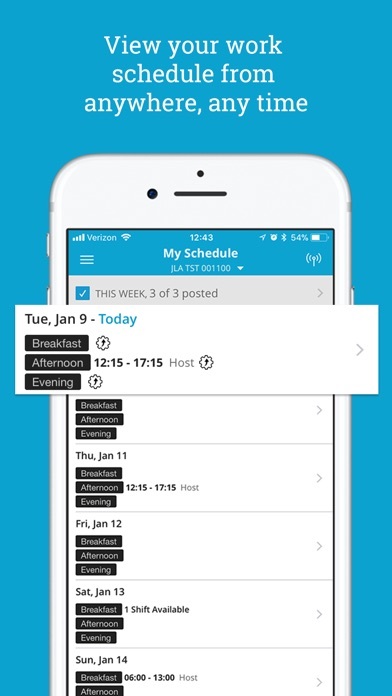 This app does a smooth job of managing your work schedule. It allows for simple communication between the work staff and managers, and has a very easy-to-use interface. Please give the option to release shifts directly to another person!! And why on earth can multiple people pick up the same shift???? That’s so unfair and a waste of time make it so only one person can pick up a shift at a time. This new update has made it so none of my coworkers or myself can see our schedules please fix it quickly. Since this newest update my hot schedules doesn’t load my schedule. I tried logging out then logging back in but that didn’t do anything, Ive refreshed it like it says and still nothing! Whenever y’all do a new update you always log me out of the system and when I try to log back in with the username and password that I know are correct it says that the client is inactive. Which it’s not because I have a schedule on there. Also you’re fixing things that previously were not broken. What’s wrong I can’t get into my app or the site online! Please fix! This app would be perfect if it had touch ID to log in! It never keeps me logged in even when I check “remember me”, so it’s annoying having to type in all my info. The reviewers who cavil about minutiae are probably unrealistic; what do you expect for $3? It’s a brilliant app, and well worth its price. I can see who isn’t working (to swap shifts), negotiate all sorts of deals, message w/o having a phone number, and managers can approve shifts IMMEDIATELY. I used to manage schedules new-old school with Excel. While HS’s features are still clunky, they’re an improvement in design and speed. I would hope at some point that HS would work in an algorithm to automate staff shift rotations, but with all these features, and for its current price, this app is well worth its value. The app doesn’t show when you took a time frame off. Makes it hard to remember when you are trying to pick something up. Also it Crashes a lot. The iPhone app has stopped working. It does not show your schedule (going on 3 days). Several of my co-workers have contacted them and we keep getting told that it’s been escalated. I’ve been on hold for 2 hours and still no one. Yesterday I was on hold for 2.5hours then got hung up on as soon as I said hello. To say the least customer service is no there priority even though their site states such. Frustrating not being able to pickup or swap shifts without going all the way in to the site. I have had this for a while all of a sudden it says it can not connect to the server, so I had to delete it and use the web site. Need to update it again!! I just recently updated hoping it would fix the problem from it saying “no network connection”, but unfortunately it still hasn’t fixed the problem. I think y’all will have less people using your app until you plan on fixing the current problem. It is not good. I’m having to rely on my google calendar on my phone that I had to access from my HotSchedules on my computer. I’ve uninstalled the app, redownloaded, restarted my phones and still not working (unable to view my schedule)It says no network connection! Yet I login online and it works, I paid for an app yet unable to used it! Very frustrating!!!! I’ve never had a problem with the app before today; I got up this morning and checked my schedule and it read “no network connection” which I thought was just my area but everything else on my phone is working. The app is sending me messages that my schedule is updated but I can’t see when I work. It’s irritating that I paid for an app that doesn’t work. It’s a good app but not really intuitive. It needs Notifications when coworkers post their shifts for example. Such a great app. Super easy to use and worth the $. The online one doesn’t compare AT ALL. 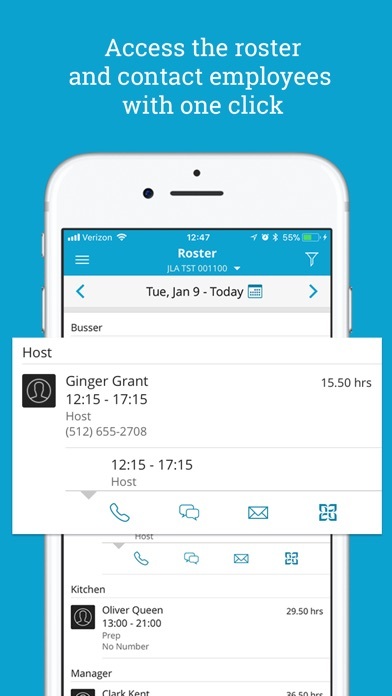 On the app it’s easy to swap and pick shifts up and you can see who you work with as well. 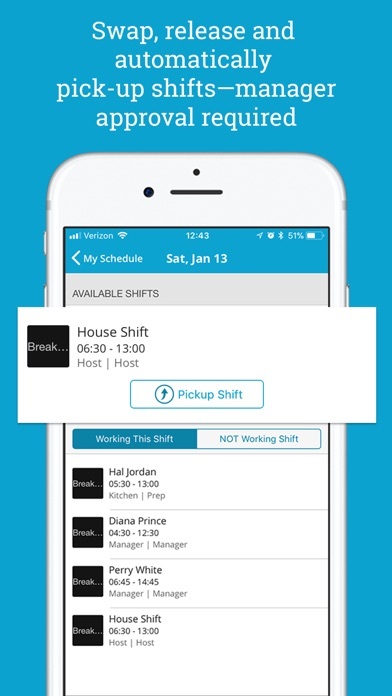 The app does not show extra shifts available for pickup. I don’t know how many shifts I’ve missed out on. I tried reinstalling it, but it still doesn’t work. Please give the option to release shifts directly to another person!! No user friendly for servers. Missing a lot of the positives from schedulefly. Everytime I use this stupid app it makes me log in. If you’re going to charge people money fix you app. This app is trash. Either make it where I don’t have to log in everytime I open the app, or give me my money back. Payed for this garbage to crash and stop working when I need it. Smh. I hope a competitor comes out soon. Paying three dollars for a slightly more functional version of the website seems a bit unfair, first. Second, it seems we are unable to receive a real-time notification (either through the app or SMS) of when somebody on your staff releases a shift, forcing you to log into the app often just to check. ScheduleFly has this functionality and it serves a great purpose. I’d love this to be added. Please fix the bugs in the new update!! Won’t let me access ANYTHING. Saying my account needs to be assigned to a hierarchy to see anything. AWFUL. Wish there was a remember me button so I didn’t have to type info every time. The app requires constant updates. It’s excessive and disruptive. this app should include the amount of hours we worked this week if we are paying for the app. There is absolutely ZERO REASON that a company that charges so much money for other companies to use their product should still make users pay for the app. I've gotten into trouble at work because the text notifications that I'm signed up for FOR FREE didn't go through and I was late for a shift. If you can't provide a quality product for free after charging so much to use it, you need to adjust paying for the app. Get it together. Improve your product. So convenient and well run. The only suggestion I have is in addition to the calendar sync the app currently offers, and automatic contact sync would be great too!! The app provides a lot of functionality however it falls short when it comes to scheduling. If you are a manager looking to create your schedules using the app and your iPad then you are going to be disappointed because the functionality is not there. The only way to create schedules is to use a Microsoft web browser with drag and drop functionality. Who cares about a random fact. List what bug fixes you did and how you made your app better... sad. Love having everything right at my fingertips! My work schedule, availability, requests for days off, etc. Also can get a hold of other drivers if I can’t work. Makes leaving messages for other staff members extremely easy! Don’t know what I would do without this app!!! Paid three dollars so I expect it to work. Doesn’t even log in after the first time. Love the app, as a manger it makes a lot of resources readily available. 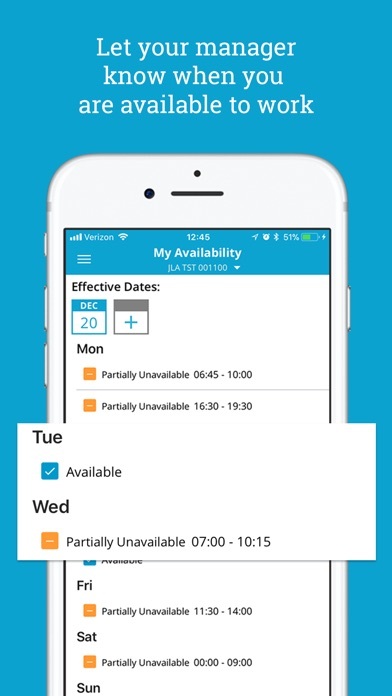 I would like to see access to scheduling added on the app but overall happy with the product. Every time you force me to update your app, I've lowered your rating by one star. You changed the color of the app logo from green to blue, and I don't think you understand how much we use color to locate apps with our eyes. Stop forcing people to download your updates. This app is useful but the fact that I have to constantly update it to even use it . I’m updating right now for font colors like is that even necessary?? No . It’s for work . I shouldn’t have to keep it updated with unnecessary updates to use it . The new update is horrific. the App was good as it was until they started to make changes like how it looks al the colors or the fonts... now it crashes all the time and they put a new upgrade in the app store every couple of weeks. Instead of trying to make their app more "trending" with the look .... (last updated they change their color from green to blue), they should focus their efforts on the code behind all that so errors like " NSXMLParserErrorDomain error 76 null " don't happen. Not hard to figure out. Very convenient. Every time I open the app it re-adds my shifts to my schedule. So on my calendar there are always 5 - 6 of the same event. It’s ridiculous. This app makes you update on a monthly basis. Ahhhhhh!!!! How many different passwords does one person need?!? The app is okay, but it’s really slow and lag-y. It’s really just mediocre. Definitely should not be charging $3 for something so average and slow. The When I Work app is a million times better AND it’s free. I am forced to use the app. Half the time it takes several minutes for anything to load, if it even does load. The messaging part only loads 30% of the time. This includes the website. I love the idea but hate the execution! Should include ability to see entire posted schedule from a week point of view as seen on the website. Would help in switching shifts and seeing availability. This app and the online version really frustrate me because the set up is so difficult. I should be able to open the full schedule for the whole week or month and see everyone whose working. I hate how I have to click on the specific day, and even online it was hard to find the whole schedule at first. This app & website LITERALLY crashes EVERY. SINGLE. DAY. Don’t waste your time. I know I have to work today but hmmmm let’s see........ I wonder what time I should go in????..... well guess I’ll just wing it since I CANT SEE MY SCHEDULES!!!!!!!!! I’m frequently having to uninstall and reinstall this app because it tells me there’s an “error” that I can’t fix no later what I do. I’ve pulled down to refresh, nothing. Turned my phone off and then on again, still nothing. I can’t see my schedule. Please fix this! I love the HotSchedules app I just wish there was a way to switch between two jobs in the app without logging out completely. I’ve been using this app for quite a few years, and I’ve enjoyed it up until this recent update. This is useless to me. I used this app to access my schedules because it was easy to use, and a simple UI. I absolutely hate using the desktop version of Hot Schedules, and now I’m you’ve turned the app into the desktop version. I hate this update. Can I have my money back??? It needs to have an option to view an entire schedule for all employees for a week. Every time my wife or I connect to WiFi the app creates new events for Every shift. This week we have 67 event notifications so far. It’s been this way for at least a year. Hey! I would love if there was a way to schedule recurring availability complications, such as not being able to work until after 5 a few days of the week. Right now I can only make schedule adjustments for 4 different weeks, which is frustrating when I know I'm going to have the same days off x numbers of weeks in advance. Also, being able to edit the availability rather than having to delete it and redo it entirely anytime something comes up would be helpful. Hot schedules? More like hot garbage! It’s not enough that you have to pay $2.99 for this app after my boss already paid for it but the app DOES NOT WORK. You can’t see when your shift ends and you can’t see your coworkers schedules so trading shifts or trying to get a shift covered is a nightmare. AND you can’t request a day off if it’s more than 4 weeks away. Why wouldn’t you and your scheduler want to be on the same page in terms of vacation days. This app isn’t user friendly and I can’t imagine it making sense for any business model. Try again. It’s difficult to read what shifts are available or not and you can’t release or swap unless on a computer. When you read the updates, they have a thought of the week, and it feels like someone was really high when they write them. It’s probably the only I really enjoy using the app. Along with seeing shifts and work stuff it’s pretty useful. The thought of the week really trips me out sometimes. Very confusing app, no YouTube tutorials and confusing on the computer as well. Other than that it’s a good app but it really needs to be user friendly. My apple account was hacked today and the only “damage done” was this app was installed on my phone... lets be honest; it wasn’t a coincidence. Every time the app is opened it re-adds upcoming shifts to the calendar. I’ve had up to 3 of the same shift added to my calendar, and that just means 3 alarms going off for one event. Extremely annoying. Please stop with the updates!! It seems like there is a new one every few weeks that is mandatory to download. I've been using the app for almost five years now. I liked the green a lot better than the blue. I greatly miss being able to see what order you are for request offs for a specific date and the number of requests for that date as well. It used to say you are 2 of 10 or 3 of 5, etc. It was extremely helpful to plan for specific days to request time off instead of constantly bugging my managers to tell me how many requests there are to plan for vacations, etc. Unless you’re a manager, regular staff can only view the time their shifts begin but not when they end. Can we PLEASE see other staff that have their shifts released and who is on auto pick up. Would make decisions easier if you should release or pick up. Worst schedule app I have ever used. Better off logging onto a computer to get to your schedule. Although you pay for the app, you get asked multiple survey questions that are of no relevance to me personally. The app shuts down constantly, will not let you log on for longer than 30 seconds without saying you’ve gone inactive and log you out. Then you get to start the whole process of logging in and getting the same exact survey question. Worst money ever spent! There is still no option to view the schedule in calendar format or as a whole. Why does it take about six seconds or more for a schedule to download? Things like this make me use the app less if I’m always expecting a lag in app response. Recently, I’ve been bombarded with the “Leave a comment...” text box every time I open the app and canceling it only logs me out. I paid for this app and this is the kind of service I am provided? I wasn’t going to buy this app because the website is actually quite good. Colleagues of mine said they loved it so I paid the $3. Once I logged in I first thought the app had redirected me to Safari and to the desktop version of the program, but quickly realized thats essentially what the app was... a link. I could very easily just make a shortcut for the website into an app for my iPhone for free. Seems amazing that there are still apps like this that haven’t been updated to be more user friendly for tablets and phones. I’ll probably still use the app because it’s a link to my schedule but I’m not happy about it. I’d give the program itself 5* but the app 1* so people can read what they’re actually getting for their money. Every time a new schedule gets posted I get logged out. So the moment when I most want to get on the app and see when I’m working, I have to go and find my login information. Great app but every time I log in there’s a pop up asking to fill out a survey! Just stop! I love the app and HS in general. I think the new update is beautiful, but there are some bugs. A survey keeps popping up upon opening the app, it displays the desktop view rather than mobile, requires logging in repeatedly, and syncs to calendar with multiple duplicates. Enough with the updates please! My job just switched apps and so I’m coming from another scheduling app and I don’t like how all the open shifts and your schedule are mixed together. I wish there was a tab where you could see just the open shifts and another where you can see a brief summary of what days you work. Also an email when someone puts up their shift so we can be notified ASAP if we chose to. I do like how you can see the staff and who is not working that day. I paid for the app, however it defaults to the web module on my phone. To add insult, it defaults to a web survey asking me to rate my experience. Web module on my phone is unusable, worse than the unpaid free web version on computer as I’m unable to click on anything. This is my first review for an app. I would dump it if I wasn’t forced to use it by my employer. this app used to make schedules so much easier and now since ive updated it, it logs me out everytime, asks me to do the same survey twice after i open the app and login, and now the app looks exactly like the browser version and is not very user friendly. its harder to see who you work with, when you work etc. I love the app. 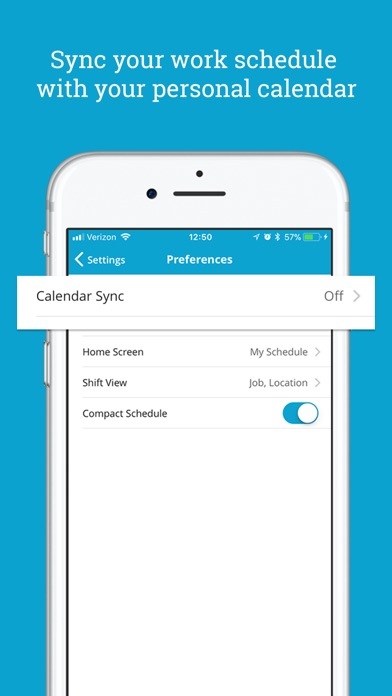 From the employee standpoint I would love a calendar update where we could automatically link our schedules from the app straight to the schedules on the calendar app. Hot Schedules should make it, if you have 2 jobs you can see both schedule on it at the same time please!!! Great app, extremely simple set up that is easy to navigate to whatever I’m looking for. Also my favorite part is the updates. Whomever does the thought of the weeks deserves a raise. And a promotion. Heck just give me an update every week so I can see those! Would be 5 stars if it wasn’t so glitchy. I love this app and it makes everything scheduled related for work very easy. But I wish they would bring back the way you used to be able to see the days you had requested off right on the “my schedule” page. It made life so much easier. PLEASE BRING IT BACK!! The new update is garbage. Go back to the previous version, this update is awful. this app used to look so nice and be awesome to use and idk what happened with the update but its literal trash now. the worst thing i have ever witnessed i am upset. i change my mind about the survey i was forced to take, i would absolutely not recommend this version of the app to anyone ever. fix this. I used to love the app. As of today it looks terrible and it’s so hard to use. I don’t get how it went from straight forward and super convenient to looking like an excel spreadsheet. Not only that, but now I have to log in every 5 seconds which is a waste of time. They need to go back to the old format. I love this and makes life a lot easier for work, but they should add an option to switch accounts without logging out. I have 2 jobs and they both use HotSchedules and I have to constantly log out and login everyday to check if there’s any dropped shifts. Would be great! I like how easy it is to give a shift up and for all the employees to see it! Plus, I can just in the app and see my weekly schedule to what days I’m free instead of going online or taking a photo of the schedule or screenshoting it. That’s just difficult for everybody. Pretty seamless performance and overall a great app. What could make it even better is to come up with a way for managers to edit schedules from an iPad so we can work on it in away from the desktop! Can’t live without this app. But, please for the love of god bring back the Green theme. Or at least give people the option to toggle between the Blue and Green. I did not expect to get a pop up company message every time the app is opened after paying $1.99. It feels like a spam pop up, please add that feature as a notification on the sidebar, not a pop up I have no control over. For my company we have different workgroup and locations, I would like to see on the mobile app the ability to select certain workgroups for auto pickups. This is only available on the web version, seamless cross platform options would be preferred! I bought but I don’t know how to use, I wrote to support but they didn’t answer. I think that I lost my money!!! Good app to have, especially if you’re like me & never remember to check the schedule at work LOL - should be cheaper but oh well. Would totally give a 5 if we were able to view our pay stubs on the app. It would be so much more easier than having to log on on the browser for one thing. HotSchedules: A take on work in the digital age. I love my job at TopGolf, and the people I work with. Although, there have been times where my shifts weren’t posted due to the app’s laggy service. Great app ,but not worth the cash nor does it tell you when you get off. I couldn’t believe it when my boss told me I was going to have to pay money to see my schedule! There so many free apps out there for scheduling. I shouldn’t have to pay money to see which irreplaceable days of my life I’m selling so I can struggle to keep a roof over my head. Would love to be able to make a schedule with out having to go and sit down on a computer. With today's tech, you'd figure it would be easy to do. And still not optimized for iPhone X. You guys need to revamp the UI for iPhone X users! I can’t believe I had to pay $3 for this app that I have to have for work. I have had this app before and when I did it was free. Besides that, it’s good. I paid $3 for a app that never works right. I’m getting really annoyed when it tells me I took too long to type in my information to log in when in reality it takes me 5 seconds max. Then when I actually do get to log in, it takes forever to pull up my schedule. Worst update ever. Takes 4 minutes to open up my schedule after aleasys inputting my user name and password 2x. Once at the beginning of the app opening. And one 2 min later when it loads the My Pass Screen. What’s the point of clicking remember me if it won’t remember your user name ? Terrible app as of December 2018 updates. I have been using this app a little over a year and I love it but this new update is very confusing. It won’t say the end times for my shifts so I never know if I work 6 hours 8 hours etc and I like being able to know how many hours I’m working that day. The only way I can check for the end times for my shift is if I go online not through the app which is a bit annoying since I did pay for the app for the convenience of not having to go through all that logging in. Other than that great app, just a small issue of the times it shows. app was good but THERES A BUG! I bought an apple watch and this automatically installed on it. Every time I tried checking my schedule on my watch, i would get “invalid login token” and i’d need to log back in through my phone and then go in on my watch. its very annoying. fix please. iOS doesn’t show end times to anyone’s shifts. It only shows start times which makes this app useless, since I’ll need to go on a browser to look anyway. Please fix this! This “app” is wonderfully done!!! 😁😁😁; I can see ALL my shifts—starting and ending times! !— I’m glad someone “thought of” an “app” such as this!!! Keep up the GREAT 👍🏻 👍🏻 work with it!!! it’s a great platform for employers and employees, but if you have more than one job and both employers use hot schedules you need to create different login accounts. wish they’d fix this. Allowing us to have two different tabs of you have more than one job that uses hot schedules. I think it would be very beneficial to have two different logins. So people who have another job can easily access other schedules instead of logging out and having to log into the other one. So I just got the guts to finally purchase this app because my other fellow employees have it and love it. But it won’t let me log in. It works through safari but not through the app. Plz help. The need for the account is not clearly stated and the account cannot be obtained other than through a company. This makes the app useless and it’s non refundable! Why would an app that charges its services even be a paid app!? Since the update when I open the app it’s asking me to change my password. And I’ve tried several they say are okay. And when I click confirm it loads forever and then doesn’t do anything. I click it again, same thing. I try with a different password, same thing. Now I can’t see my schedule. And you charge people to download this app and you have serious bug problems constantly. Scandal. They did an update the other day and now it won’t load at all. Tired deleting and reinstalling several times with no luck. Sometimes it logs me out but other than that, it’s super easy to use. Love this app! Best thing that ever happened to the restaurant industry and allows for flexibility. The app no longer shows when shifts end. This is absolutely ridiculous and has basically made the app useless. The ability to view the full schedule was removed awhile back, making it difficult to coordinate swapping shifts with coworkers. I regret buying this app. If I could leave a zero star rating, I would. Where are my shift end times??? This is awful. Only shows my shift start time and not end time. Update is awful. Not working! browser + app are completely dysfunctional. And it is making my life much harder. The app says that it is not longer supported by the device but I am unable to download the new version from my App Store. The browser version isn’t working either and I’m stuck with having to harass my managers for scheduling conflict when things shouldn’t be as complicated. HotSchedules you’re failing on your mission! I usually don’t post negative reviews but I keep encountering technical issues with the app AND website and I came to a point of ultimate frustration. Don’t waste your time and money on HS. Recent update only shows the start and not the end time of the shift. Why? Fix this. Only shows shift start times, not end times, need this fixed ASAP!!! Since the new update, the schedule does not show what your out time is. Please fix it! Like the variety of this feed - thanks! App updated now i can’t see my out times even though none of my company or my settings have changed. And if I use the regular website on safari or a computer then I can see them. Also it loads so much slower now than it used to. In addition to not even being able to log in to the website OR app currently (which is absolute GARBAGE), there are not many things RIGHT with HotSchedules. I would list everything wrong with this app/program, but that would take entirely too long. Let’s just recap the main reasons why this HotSchedules is the bane of my existence.... 1.) the website OR app fail to work 50% of the time. 2.) it is completely unrealistic for a large business as not more than one person can work on a schedule at a time. 3.) it’s wiped ENTIRE schedule I had wrote out for 3 months in advance. 4.) customer service (lack thereof) is non existent. 5.) the only updating they care about is the appearance of the app, absolutely no concern with the functionality of the program itself. 6.) we ACTUALLY have to pay for this monstrosity of an app and to use it for your business. If I could leave it no stars, I would have. Save your time and your money. Since the app was updated I can no longer log into my account but i can still access the website through the browser. Will change review if fixed. Anyone I know with an iPhone, including myself, can’t see the times their shifts end. It only shows start times. Please fix this. Update is making it worse. The page isn’t loading. You need an update that works. This actually made it worse. I use to be able to see what time I started and what time I got off work but now I can only see what time I start. That’s frustrating because I like to know what shift I’m working. used to love this app then the recent upgrade made it so the end time of shifts is unavailable to see!! please fix!!!! WHY WOULD YOU YOU ONLY PUT IN TIMES ON HOT SCHEDULE?! It makes no sense now people don’t know when they will be off work. You need to change this. For example: it used to say 11:00-4:00...NOW it just says 11:00 there’s no out time!!!!!! We can only see the clock in times. Not the rest of the scheduled shift. Not bad but what’s with the new update? I don’t have as many problems with this app as other people, it works just fine for me but the new update has taken away the feature that tells us how long our shift is? For example, it would say 1:00-9:00 but now it just says 1:00 and doesn’t show me the ending time at all, like what? Who thought that was a good idea? It shows up on the website but not the app so basically I paid $2.99 for absolutely nothing. Sometimes when I go into put my availability in the app crashes and closes. Never logs in, forced to pay for an app that doesn’t work ever. Awful. Website works just as terrible. More problems with this application and website than any other. Employers should NOT use. Ever since they updated the app it’s been horrible. It now doesn’t keep you logged in and every time I try to log in it says that I, “took too long to login.” This app used to be easy to use, now it’s just a nightmare. Every time I try to log in it says log in took to long. I’m not the only one experiencing this either .. everyone at my jobs app does the same thing. Upset I paid my money for this app when I haft to go online just to view my schedule. Please add ability to see when others have requested time off so I can request to work that shift. Most recent update is HORRIBLY AWFUL. Now there is no way to see the entire week at a glance. Cannot see coworkers schedule for the week without tediously going into each and every day. It’s awful. I haven't been able to write a message since 10/13. No one but the managers can write a message. It's hard to communicate without this feature. Great concept mobile app needs work!! Why do I need to log in every single time?! And why does it ALWAYS say it took too long to log in and makes me log in a bunch of times before it works?! This app needs serious attention! Please fix. After update any requests for time off don't show in calendar. So annoying. Have to keep going into the requests for time off section and then comparing with calendar. Please please fix!! Also any requests I had in there have been deleted! This app is phenomenal for business!! Read my review guys! Great app, extremely simple set up that is easy to navigate to whatever I’m looking for. Also my favorite part is the updates. Whomever does the thought of the weeks deserves a raise. And a promotion. Heck just give me an update every week so I can see those! Updated comment: I wrote this review almost a year ago, and guys they still do the thought of the week. Did that guy get his raise? Seriously send him my way if you don’t just so I can pay him to make one does me every day. Great app. Easy to use. And updates are still perfect!!!! Please fix so I can see coworkers for the entire week. If you have an iPhone don’t waste you’re money. The app won’t work. The web version isn’t much better either. Pretty looking and all, but what happened to the order of time off requests? Too much of an inconvenience for the managers? I can request a day off but won’t know the number of people who have already requested the day? And it what position I am? Am I 1st of 10? 7 of 10? It makes a difference to know .!!!!!!!!!! The whole idea behind hotschedules is supposed to be conveniency but this app is anything but that. What's the point of having a "remember me" option if it's still going to make me log back in EVERY SINGLE TIME the app gets minimized for 2 seconds or god forbid my phone screen goes to sleep. That's if the app even lets you login in the first place, lately almost every time I try I get an error message saying that I took too long to login; apparently the 20 seconds it takes to retype my information isn't fast enough. They just updated the app and I couldn’t log on. Called customer service and they told me to delete the app and redownload it. It forced me to pay $2.99 just to redownload the app that I already had!!! I paid for this app and every time I open the app I have to log in again. Sometimes it won’t even let me log in! It said “you took too long” and makes me restart and I’m lucky if I get in that time. This needs to be fixed. Hot schedules is great if you have one job, but it’s sooooo annoying to constantly log in and out between accounts. It would be great if they could develop a feature like Instagram, where it would be possible to remain logged in to two or more accounts and switch back and forth seamlessly. Please update for iPhone X!! It runs incredibly slow, crashes and isn’t full screen. I had to pay money to be able to see my schedule on my phone, so I expect everything to run smoothly. The log in portion of the app is terrible. Half of the time it tells me I took too long entering the information and the other half it takes 5 minutes to load my schedule. I’m very disappointed in the app. Please fix it. My restaurant uses this system which pretty much forces you to buy their app, there definitely needs to be a free version if all I want to do is check my schedule! Half of the time when you try to log in whether it be the app or online through the web browser an annoying message that says “you took too long to log in start from the beginning” pops up. You have to log in every time you open the app. Since the app switched to the “Clarifi” update, the app has been terrible. This app has worked fine for 2 years no troubles and now I can rarely even log in. I shouldn’t have to pay for a service that is basically unusable. This needs to be fixed, it’s been happening to multiple people for months now. The new version won’t let you login normally. You need to use something called my-pass. What is the point of having two ways of login in if one does not work. Furthermore, when trying to use my-pass it constantly says you have timed out. The outcome being I can’t access my account. Something needs to be fixed. Clearly a bug. The new versions of the app logs me out every single day. It's very inconvenient especially because everyday it asks me to log in, change my password, and then log in again. Multiple log ins are absolutely unnecessary, I'm just trying to see what time I have to go into work. Please fix this. I shouldn't need three pages of log ins just to get into my account. I'm convinced that Trump's twitter account has less security than my hot schedules app. It would be awesome to have a feature that once schedules are posted it allows us to notify other coworkers that you’re available to pick up a shift either AM or PM or both. That way when someone releases a shift the app can tell the person who has the feeler out so they can snag it. All around nice app to have for work. Seriously every week?! So unnecessary. Also your last update on the 8th LITERALLY IMPOSSIBLE to operate the app. It loads for LITERALLY five minutes each freaking page. I can’t send messages. I don’t understand why you update every week to “fix bugs” but I never have a problem until you update it! Knock it off. This app is for work. No one cares to update their app every week. I just want to see when I work. Chill. Every time I try to log in it says “took to long to log in, process starting over from beginning.” Every time. Why did I purchase this app if it’s broken? I never write reviews but for a paid app this is terrible. It’s laggy. It crashes. It logs you out randomly. Just awful. If you want to load your schedule it takes eternity no matter your data speed. Out of all of my apps this is by far the slowest performing one. This app is trash, I can’t even log in. Big waste of money, might as well keep using the web browser and saving a screenshot of the schedule. It’s a great app, I used it here and there before. But with my new job is the main tool. And it’s quite awesome, waaayyy easier than the website version and it makes communicating fast & easy. No robot, just a happy customer. I have had hot schedules for three different jobs and it really depends on what version your company has. It would also be nice to be able to switch accounts without logging in and logging out so like Twitter or Instagram you can switch to your other account quickly and easily hot schedule does not allow that. That should be on their next update. Creates duplicate events in my calendar. What’s up with the puke green color? Surely, there’s a better color out there. 5 stars. But sometimes it soft-locks when I open up the mass messages in the top right corner. Turning your email notifications are useless for this application. Yes it’ll tell you your schedule but it won’t show you the messages inside. It will just tell you that you have received a message. I have to pay twice? I uninstalled this app of my phone once and then I tried to install again but now I have to pay for this app again!!! I think is not fear if I have to pay twice for this app!! I used to love this app, but with the recent update, now I hate it, I still have it because I need it for my job, and because I paid for it. Can you guys create an app where the schedule can be made on my phone and not, necessarily, on a computer!? That would be awesome! The new update logs you out every time. Schedules are loaded server-side instead of downloaded to the client and updated when there are changes. Terribly slow. Amazing app, help me keep updated with my schedule at any time🙃. I use this for work. A lot. Atleast a dozen times a day. It’s three bucks, worth every penny for the convenience of being connected so easily. I’ve been using this app for probably 4 years now for work... and It’s always been awesome until the latest update. Everything was so simple and easy to look at. Now, making your availability makes absolutely no sense. For some reason it says you can create different weekly availabilities for each day, and figuring out how to get my shifts I want has felt near impossible. This update has caused so many problems for me and my managers. I was scheduled outside of my availability last week and had to miss my night class to come into work. Why did the availability section have to change? I don’t understand. Why mess with a good thing. Please, for the sake of me and so many others change it back to the way it used to be. I’d be happy to leave an awesome review if you did lol. This new HotSchedules is the absolute worst! Scheduling now takes double the amount of time that it once did. The employee availability is next to impossible to decipher. I wish I had the power within the company I work for to abolish the use of HotSchedules. I can’t seem to create my profile because the create profile button isn’t clickable... I just paid for this app. Can someone please fix the issue? I love it my schedule is at my fingertips swapping shifts and requesting time off has never been so easy! The developers are awesome also. Overall a great app but there was a recent update that won’t allow you to see released shifts on shifts that I have requested off. Just because I request off, doesn’t mean I may not change my mind and want to pick up a shift. I also wish there was full capability with the auto pickup feature. The desktop version allows you to customize which shifts, sections, and people you want to pick up from, but the app won’t let you! Hot schedules used to be so good BUT NOW it never works. It logs me out every single time I get out of the app. The “remember me” on my pass does NOT work. I always have to login using my old password which makes NO SENSE. Can we get an update please ?!?! So many glitches! Annoying. Won’t let you switch shifts with one person directly. Have to release it to everyone and than anyone can grab it.. When my schedule changes, updates, or a new schedule comes out, Hotschedules recopies my entire schedule into my calendar (I have calendar sync on). The problem is that any day that remains the same is duplicated! So I can end up with 4 or 5 repetitions of the same day if I open the app more than once to check something. It’s been logging me out and not letting me back in ! I think I want a refund if the issue is not resolved !! Who thinks up the jokes and thoughts of the day that come with the updates? Honestly I hate to update any app and take the time sitting around just to update something I wish I didn’t need to have taking up all of my previous space on my phone; but the guy that does that should be recognized. Give him a raise or I’ll quit my job in protest. I don’t understand why it won’t let me log in if there’s an update, feel like in the maybe 8-9 months I’ve had the app I’ve had to update it like 10 times. If there is an update it should still allow me to log in that way I can see my schedule as WiFi is not everywhere at all times and data isn’t free. My company switched to this app recently. For 3 bucks, just use the web version. Always logs me out, when you log back in I can’t change my store location unless I re-download the app. Such a bother. Should be able to see all staff who are working on each day and shift. I bought this app with the impression that it’ll be super convenient compared to the website, and ever since I got it have to wait for 30 seconds or more just to do one action.. I’m finding better results in the website if you want me to be honest! This is the only app that I have ever purchased and it is the only one that bugs out all of the time. It lags, logs me out, and does not allow me to log in when I use my correct login information. I have to enter my username and password twice. iPhones have FaceID and it’s been out awhile, fyi. Have to enter username/password what seems like every other day. Don’t even get me started with the website. It used to be great, but now it’s frustrating to use. The app serves its purpose quiet well but the reason it has earned such a review is the lack of management nearly every week for as long as I can remember there has been at least one update of this app which requires you to re log in which in all honestly may be a small hiccup maybe 1 minute of time but it does get quiet tiring as time goes on I’ve used this app where I worked for four and a half years now and it gets the job done but it’s the only app on my home screen that requires so much routine maintenance which is especially confusing since the only real major change that’s happened in the time I’ve used it was a primary color change from green to blue So let your product work and instead of doing a million small updates how about you compile the bug fix’s and role um out all in one update at the start or end of every month KEEP UP THE GOOD WORK YALL!!! Customer service is 10/10 If you have any issues or questions, they get back to you within a day and they’re responses are always a little funny too! Good app! it works & its better than a paper schedule. but please stop making so many updates, it wont let me log in every time a new one is out, which is weekly. Makes it very easy to pick up and drop shifts. Also great to have all contacts in one place ! When does my shift end? Who knows! With the new update it never shows the end times to my shifts. So, I have to check online to see when my shift actually ends. Why did I pay for this again?